ICHP - Directly Speaking - The Need for Vision for Every Shirt Color! This month’s column is being written later than usual because I just completed a two-week community service project in Rockford called Sharefest. This is the sixth year that Sharefest has renovated Rockford Public School buildings by painting, cleaning, landscaping and doing light repair/construction by using a volunteer army over 9 days. A few volunteers (mostly site leaders, team leaders with a few general volunteers) work the week before to prepare the schools to handle the onslaught of the hundreds if not thousands of shift workers over those 9 days. This year’s projects included the renovation of an elementary school and an early childhood development center (i.e., pre-school). This year I was promoted to “Site Leader” or a “yellow shirt”. The past two years I served as a team leader or a “black shirt”, responsible for leading a team of volunteers each shift to address a specific task or area. The previous three years I was a general volunteer (given a navy blue shirt, gray shirt and powder blue shirt each year, respectively) so I guess the progression is natural. The shirt colors are important to identify the leaders as the volunteers may only serve for one four-hour shift and will probably not know their team leader by name or even face, so the recognition of leadership is critical with the temporary and transient staff. This year as an austerity measure, general volunteers were provided shirts from previous years (navy, 2007; powder blue, 2009; royal blue, 2011; or two shades of gray, 2008 and 2010) free of charge or they could purchase an orange t-shirt which will be used this year and in future years to standardize worker identification. This year also featured a new magenta colored shirt which identified members of the design team. The magenta team worked with the yellow shirts to plan the color schemes, make the remodel plans and process the mid-course corrections during Sharefest to make things work and look better whenever they could. I learned a lot as a new yellow shirt, but I think the most important concept I gleaned was that even though this was a volunteer process and there was plenty of leadership available, vision is required at all levels in order to do the best job! In that way, Sharefest is just like healthcare. 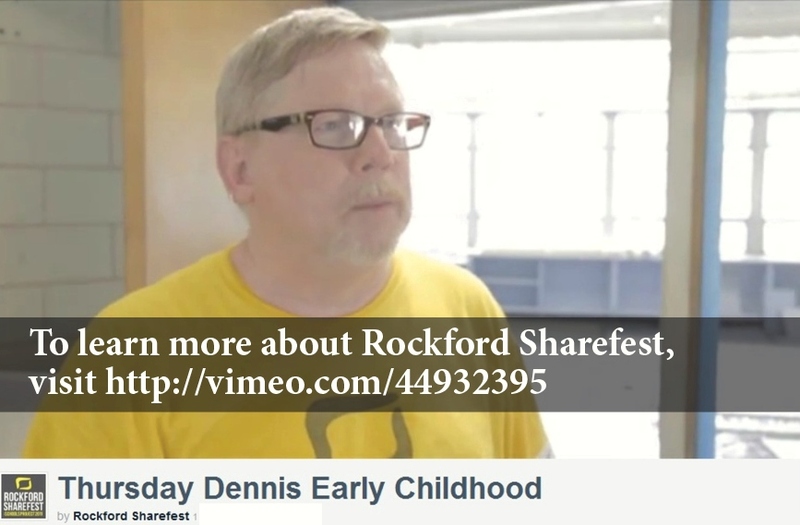 At Sharefest the workers are volunteers, and they’re there because they want to help the kids of the Rockford Public Schools and want to do a good job. In healthcare the workers are paid for the most part, they’re there because they want to help their patients, and they also want to do a good job. That is, if they have vision. It’s my opinion that when you introduce pay into the equation, sometimes vision can slip away. People look at their work as their job and in order to keep it, they develop an attitude of “l’ll just do what I’m told.” By doing what you’re told, you lose your vision of the bigger picture. You stop looking for ways to improve processes and outcomes. Sometimes it seems like it is more important to get it done than to do it in the best manner possible. At Sharefest whenever a general volunteer (an orange shirt from here on) was given a task, the black shirts (team leaders) and occasionally the yellow shirts (site leaders) were there to answer questions and provide guidance. However, for the third year in a row, I found that several of the general volunteers asked questions or made observations that led to process improvements. Their questions came as a result of a clear vision of the outcome and a strong understanding of the process. I thought about this on the way home one night and reflected on how this applied to healthcare. In hospitals and health-systems there are the equivalent to the yellow shirts, black shirts and orange shirts. The yellow shirts are the hospital administrators and the Board of Directors. In fact, the Board of Directors are probably more like magenta shirts (design team) because they are usually designing concepts without strong knowledge of the details required to accomplish the plan. The administration creates the overall plan for the health-system and has the big picture vision in mind. The black shirts, in my opinion are the physicians. They lead a team of highly educated and qualified specialists (pharmacists; nurses; respiratory, occupational and physical therapists; laboratory technicians and dieticians) to care for each and every patient. The pharmacy department has its own colored shirt hierarchy, too. The Pharmacy Director is the yellow shirt with the overall vision and plan for the care the pharmacy staff provides to the patients. The Clinical Coordinator and the Pharmacist Manager are the black shirts on the pharmacist side making sure that the clinical care is provided in the appropriate and most efficient manner. In bigger health-systems these folks could be yellow shirts and the pharmacy supervisors serve in the black shirt role. Finally, the technician supervisor is the black shirt on the pharmacy technician side to oversee drug preparation and distribution. At every level, both within the health-system and within the pharmacy department, it is critical that every member of the team have a vision of their task and what its optimal outcome should be. Certainly there is a significant difference between renovating a school with volunteers over the course of 9 days and operating a health-system day in and day out 24/7/365! However, there are similarities, too. The complexity of a health-system and the planning and design that takes place every day is often lost on the new or even long-term employee because the “it’s always been there” and “it’s always been this way” atmosphere develops over time. We see new programs established, but do we often think of the planning that went into them before they were even rolled out to the black and orange shirts? As employees of a bigger system, it becomes easy to focus on the small things that may not work exactly right or may make us move out of our comfort zone when a new program is implemented. Do we consider at that time what planning took place to reduce the discomfort to the limited level we experience? It seems to me that every member of the pharmacy team should constantly and continuously think about the overall vision for the health-system and the overall vision of the department in whatever job or task they undertake. They should always search for ways to improve the processes and outcomes, reduce costs, and reduce waste. We also need to always remember that if we’re an orange shirt, there’s always a black shirt to ask or bounce an idea off when an opportunity is identified. If we’re a black shirt, there’s always a yellow shirt you can go to. The yellow shirts in the pharmacy department have black shirts and yellow shirts above them within the health-system, and if this column reaches a yellow shirt within a health-system, what I learned this year is that there are always other yellow shirts and black shirts who are willing and able to help out when the need arises. I hope I didn’t confuse you with the shirt color analogy, and I hope I didn’t bore you with the brief discussion of my summer work-ation. I’ve known about having a vision all along but don’t always think about it, and I know that it’s easy to get in the “just get it done” mindset. So if I’ve created a spark to light your vision, let me know what it is for the future of your department and the future of pharmacy, so that I can continue to learn and improve the processes and outcomes within ICHP!